January 16, 1919, was a dark day indeed. On that date Congress passed the Eighteenth Amendment outlawing alcohol, with the hopes of putting an end to drunkenness, crime, mental illness, and poverty. Prohibition actually led to an increase in organized crime and resentment toward the federal government ran rampant. Americans endured 13 years of Prohibition and the related, widespread problems it caused. 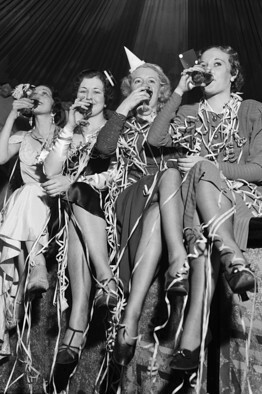 The good news is today is Repeal Day! This date commemorates the 77th anniversary of the day the United States repealed the Eighteenth Amendment and returned to its citizens the constitutional right to enjoy a cocktail. On December 5, 1933, Utah, the final state needed for a three quarters majority, ratified the 21st Amendment, repealing Prohibition and restoring the American right to a celebratory drink. So go out today and exercise your rights as an American citizen! You don’t need a costume. No decorations needed. Just stop by a favorite bar, pub, tavern, or friend’s house today and lift a glass! If you’re celebrating at home today, here’s a recipe for one of the oldest (definitely pre-Prohibition) U.S. cocktail recipes, The Sazerac. Add sugar, rye, bitters, and ice to a cocktail shaker. Shake until well chilled. Add Absinthe to the serving glass and swirl to coat. Strain the contents of the shaker into the glass and add the lemon peel.